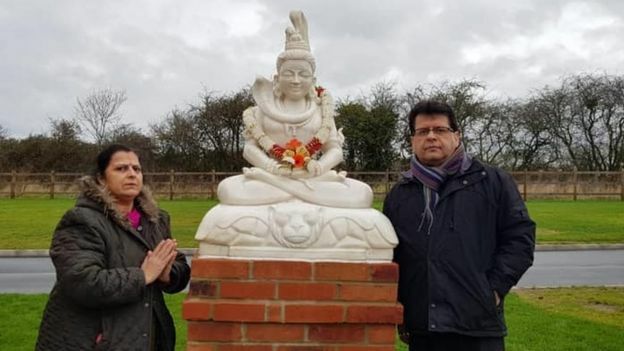 A cemetery in Leicestershire is believed to be the first in the UK to have an outdoor shrine dedicated to a Hindu deity. The white marble statue of Shiva, which weighs about 350 kg (770 lbs), has been placed in the grounds of Great Glen Crematorium. Care home owner Sailesh Raja, 58, who donated the statue, said it was “very important” for the Hindu community. A celebration is due to be held on Saturday afternoon. Mr Raja said installing the statue was a “great achievement for the Hindus of Leicester”. He said it meant that mourners no longer had to pray to pictures of Lord Shiva following a funeral service. Instead, for the first time, worshippers can now perform an outdoor Shiva Abhishake, in which offerings are made to the god. Leicester has one of the largest Hindu populations in the UK, and its Diwali celebrations are among the biggest outside of India. The Hindu Council confirmed Great Glen was the first UK cemetery to allow an outdoor shrine dedicated to Lord Shiva. This entry was posted in EUROPE, EUROPE - News, HINDUISM, HINDUISM - News, LATEST NEWS, LATEST NEWS - News, WORLD, WORLD NEWS. Bookmark the permalink.